As cannon thundered and rifle shot crackled less than 100 yards away, Roy McMillan replaced a fuse in his 12-passenger van so he could distance himself from Union and Confederate forces April 26. He was getting ready for a trip that afternoon to Prattville where he and his Gospel music group, the Angelic Harmonizers were set to perform. “The noise doesn’t bother me but they ought to tell the truth,” the husky baritone said over the distant military commands and musket volleys that rattled his Sunday afternoon. He said he applauds the money that flows into the otherwise moribund economy and is ambivalent about the crowd’s embrace of the Confederate force. But, he said, he is fed up with the South painting itself as valiant underdogs in what he viewed as a battle to end slavery. “Instead of telling the truth, they still telling a bunch of lies,” he said of how the re-enactors stage the battle as a noble sacrifice by beloved Rebel commander Nathan Bedford Forrest and his men. The national focus on the 150th anniversary of the end of the Civil War and the 50th anniversary of Selma’s role as a key site in the battle for black voting rights heaps attention on this sleepy Southern town on the banks of the Alabama River. 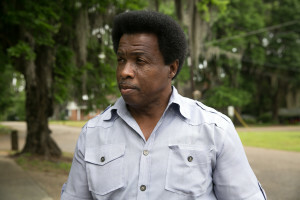 His two-story house is one of several sitting on a ridge just beyond the site of the final day of the three-day re-enactment of the Battle of Selma. Putting up with the thunderous re-creation of the late-Civil War clash has been a reality for him for most of the 30 years he has lived in the house at 54 Riverview Avenue in Selma. Most years, he said, he just ignores it but lately the commemoration of the 1865 battle has been drawing more spectators, more traffic –and more attention to one of the last gasps of the conflict. Copyright 2015 Morgan State University and West Virginia University.